Welcome to the shows and presentation at London Fashion Week season Fall/Winter 2019. First we’re gonna to present the fashion show of UK based fashion designer Bobby Abley. Bobby Abley is known for his unique charm, wit and humour, blending nostalgic and playful imagery with a contemporary menswear design. Launching his namesake label in 2012 and receiving a place on the prestigious MAN catwalk for the inaugural London Collections: Men, Bobby Abley is one of the breakthrough menswear names of recent years. now part of the newgen platform From the London design studio, Bobby Abley has taken the international markets by storm and is available exclusively through the worlds leading retailers. 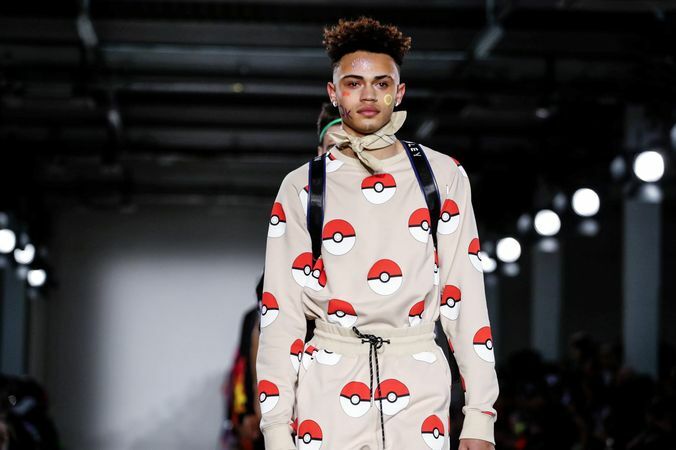 The classic character Pokemon is printed in the new garments and pieces from the new collection of Bobby Abley A/W 2019, had plenty of bright colours and also Christina Aguilera motifs. Bobby decided not to participate on the last season Spring/Summer 2019 in LFW. He wanted it to give time to make things straight and right, then on August 2018 he started to post regular on Instagram. Firmly established and instantly recognizable the unstoppable momentum of the Bobby Abley brand continues.